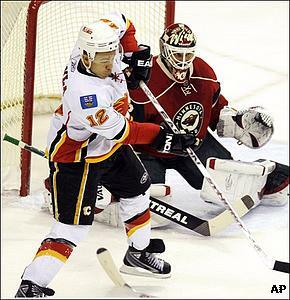 Jarome Iginla has stalled in his attempt to become the Calgary Flames' career goal-scoring leader. The four-time All-Star tries again to achieve the milestone when the Flames host the struggling St. Louis Blues on Monday night. Iginla was held scoreless for the second straight game Friday in Calgary's 2-1 overtime loss to Nashville, leaving him with 364 goals and tied with Theo Fleury for the top spot on the Flames' list. In his 11th season with Calgary, Iginla is among the NHL leaders with 40 goals and says the record goal is secondary to his team's chase for a Northwest Division title and a playoff berth in the Western Conference. The Flames (35-23-10), who are 6-1-2 since dropping two straight, are in playoff position and battling Colorado, Minnesota and Vancouver for the top spot in the division. "To be honest, I'm not that anxious," Iginla said. "It's not the most important thing. It's about getting wins and moving up (in the standings). It'll be cool when it happens." It could happen Monday as Calgary seeks a third straight victory over St. Louis (29-29-10) to take the season series from the Blues, who have lost the first two on a season-high nine-game road trip. The Flames, winners of five in a row at home in the overall series, are 11-1-1 against St. Louis since losing six straight meetings. Iginla has produced against St. Louis throughout his career. He had two goals and two assists in a 5-3 road win Dec. 16 in the most recent matchup, giving him 16 goals and 31 assists in 43 games versus the Blues. On Monday, he'll look to spark a Flames team that has been held to one goal in three of its last four games. Craig Conroy scored the only goal for the Flames for the second straight game Friday as Calgary fell to 0-for-10 on the power play in the last two contests. "We definitely need some more goals and have to get the power play clicking on all cylinders," Conroy told the team's official Web site. "We have to get that killer instinct. We get one goal, then we maybe feel like we're just going to hang on." Miikka Kiprusoff made 34 saves, but lost in his first game since stopping 39 shots in a 1-0 win over Columbus on Tuesday. Though Kiprusoff has lost three of his last four starts, he has posted a 1.86 goals-against average in winning his last eight starts against St. Louis. The Blues fell 4-2 at Vancouver on Saturday for their eighth loss in nine contests, leaving them with the second-fewest points in the West and close to missing the playoffs for the third straight season. "Not making the playoffs last year was the first time I've ever not made the playoffs in my career and it was a tough pill to swallow," said St. Louis' Manny Legace, who made 25 saves in his 26th straight start and 299th of his career. "But watching it slip away is tougher than last year. This year we got off to a good start and just haven't done anything since January. It's just frustrating." Brad Boyes scored twice to snap his eight-game goal drought. 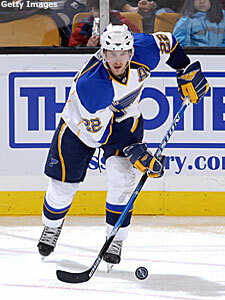 Boyes has a team-leading 34 goals this season, including two against Calgary.